Welcome to the European Fire Sprinkler Network! The EFSN is a coalition across the fire safety, political and other relevant communities which encourages the greater use of fire sprinklers to save lives and protect property and the environment. Each year fire is estimated to kill over 4,000 Europeans and injure 100,000 more. It also severely damages local environments and is estimated to cost economies 1% of GDP. Yet it need not be so. Where cities have widely installed fire sprinklers, fire deaths have been almost eliminated and injuries and property damage reduced by over 80%. Many fire safety experts are now therefore convinced that the widespread fitting of fire sprinklers is the most efficient way to reduce fire losses. 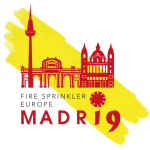 The European Fire Sprinkler Network collects and distributes accurate information about fire losses and fire sprinklers, and connects and supports those who believe that fitting fire sprinklers is essential to help Europe save itself from fire. As a not-for-profit organisation for the public good, the Network welcomes members from many different backgrounds with a common interest in better fire protection. We need your membership to add weight to our message and to develop our activities. Please download our Application Form and join today! This form collects your email address so that we can send you information and updates from EFSN. Please click this message if you wish to view our GDPR Policy. I consent to EFSN collect my details via this form.